I recently visited Shalom Books on Skillman Avenue. This store always confuses me. Its name appears to be Jewish, but in its windows it displays Christian statuettes and no books. Hoping to speak to the owner, I approached a shorthaired woman in her fifties. When I told her about the Sunnyside Sound Project, she pointed to an older fellow sitting in front of one of the store’s two computers. I scurried around the store, leafing through some anti-abortion books. Then “the mayor” finally received me. John has lived in Sunnyside since the mid-nineties. Due to an old work injury he incurred while shoveling snow during the blizzard of 1993, he receives disability and worker’s compensation. A self-proclaimed community watchdog/helper/networker in his mid-sixties, John is well known among storeowners in the neighborhood. I think it was Dan from Stray Vintage who first mentioned his name and title to me. As he often does, “the mayor” had some time to spare and we decided to talk about his doings over coffee and cinnamon tea at the Aubergine Café. 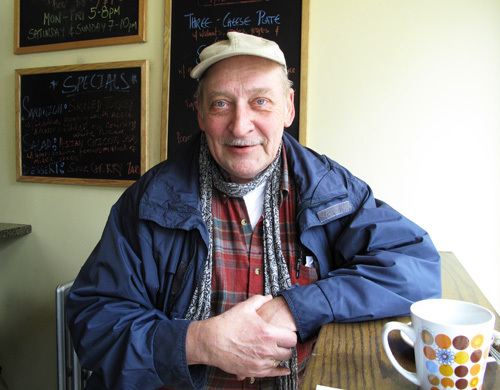 John has contributed stories to local papers about storefront graffiti, dead tree branches, illegal dumping, as well as potholes and sinkholes. Sometimes he directs fellow residents to the city councilmen or helps them with unjust parking and Sanitation tickets. In his free time John also “revives” his Catholic faith and writes. More Sunnyside local color, if I may: There’s a grocery-deli across Skillman Avenue, run by a fellow named Ata (pronounced AH-tah) and his tiny Korean wife, Chun (which in her language means “one thousand”). I’m always welcome to come in and “set a spell”, and I often do, especially if the weather is bad. Ata is a good storekeeper, storyteller, source of credit in a pinch, and for me, being at that time on Social Security Disability, that pinch ran generally from the fifteenth of the month to the third of the next. That’s when my meditation was good. The place is the Queens equivalent of the southern or Midwestern general store, the cracker barrel supplanted by racks of potato chips, cheese doodles and Drake’s cake. Mornings are meeting time for a more or less regular coterie, whom I call “the gang,” “the Sultans,” or “the usual suspects.” Others refer to them as the “Skillman Mafia”. They’re guys who happen to have, at least in the morning, some of that rare luxury of today–namely, time. Time, at least, to linger over coffee and a donut or buttered roll, talking mostly about money, politics, women, or whatever, making lame jokes and trying to set the world right before their daily routine takes them hither and yon. They are generally self-employed storekeepers, contractors, limo drivers and landlords, strong men with a natural conservative bent–the Sultans of Sunnyside, as it were. Some are Romanian; some are Lebanese, others Pakistani. In the podcast, John Millus talks about the benches in front of the Sunnyside Reformed Church, rabbit hunting in Sunnyside and “gourmet delight” along the number 7 train.